The Absolute Best Book for learning Farsi language Quickly! You’ll be surprised how fast you master the first steps in learning this beautiful language! The goal of this book is simple. It will help you incorporate the best method and the right strategies to learn Farsi FAST and EFFECTIVELY. 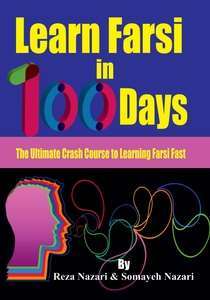 Learn Farsi in 100 days helps you learn speak Farsi faster than you ever thought possible. You only need to spend about 90-120 minutes daily in your 100-day period in order to learn Farsi language at advanced level. Whether you are just starting to get in touch the Farsi language, or even if you have already learned the basics of the language, this book can help you accelerate the learning process and put you on the right track. Learn Farsi in 100 days is the only book you’ll ever need to master Farsi language! It can be used as a self-study course – you do not need to work with a teacher. (It can also be used with a teacher). Learn To Speak Persian Fast! Learn to Speak Persian Fast is a multi-level series for Persian learners from the beginning to the advanced level. It is a breakthrough in Persian language learning — offering a winning formula and the most powerful methods for learning to speak Persian fluently and confidently. Each book provides 10 chapters covering a comprehensive range of topics. Each chapter includes vocabulary, grammar, reading and writing lessons. There is a series of exercises that gives you extra practice in using new concepts and inspires you to construct personalized conversations. Book 3 of Learn to Speak Persian Fast series builds on the foundations established in the book one and two for smooth and accurate communication in Persian. It is designed for upper-intermediate and advanced students needing a comprehensive approach to learn grammar structures and vocabulary. It gives learners easy access to the Persian vocabulary and grammar as it is actually used in a comprehensive range of everyday life situations and it teaches students to use Persian for situations related to work, social life, and leisure. Topics such as weather, sports, transportation, customs, etc. are presented in interesting unique ways using real-life information. Beautiful illustrations enable students learn vocabulary and grammar lessons effectively. At the same time, it provides more opportunities to develop reading and writing abilities, as well as more challenging content to develop students’ higher-level thinking skills. Self–guided students and classroom learners alike will be thrilled by the way they progress from one level to the next, using a combination of pictures and text to discover for themselves how Persian language really works. Effortlessly and confidently follow the step-by-step instructions in this book to achieve the highest level of fluency to make you speak Persian like a native speaker. 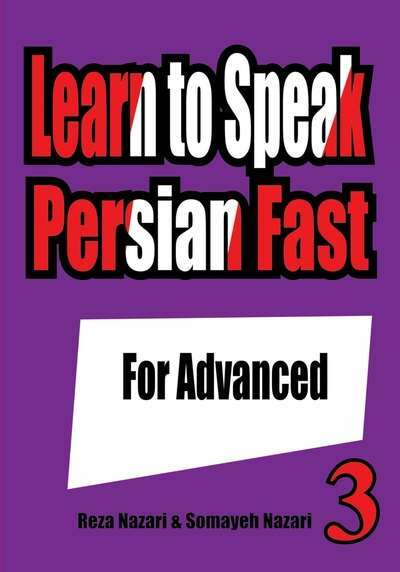 Learn to Speak Persian Fast is the only book you’ll ever need to master Persian language! It can be used as a self-study course – you do not need to work with a teacher. (It can also be used with a teacher). Purchase this Awesome Persian Learning Book on Amazon! Learn to Speak Persian Fast is a multi-level series for Persian learners from the beginning to the advanced level. It is a breakthrough in Persian language learning — offering a winning formula and the most powerful methods for learning to speak Persian fluently and confidently. Each book provides 10 chapters covering a comprehensive range of topics. Each chapter includes vocabulary, grammar, reading and writing lessons. There is a series of exercises that gives you extra practice in using new concepts and inspires you to construct personalized conversations. Book 3 of Learn to Speak Persian Fast series builds on the foundations established in the book one and two for smooth and accurate communication in Persian. It is designed for upper-intermediate and advanced students needing a comprehensive approach to learn grammar structures and vocabulary.